Home > Community > Teachers' Voices > Matthew's Classroom > New Posts > 38. HAPPY NEW (SCHOOL) YEAR!! I hope all your goals and objectives for yourself and your students come true this year! Well the big news from me is that from today I’ve returned to being a full-time teacher!! 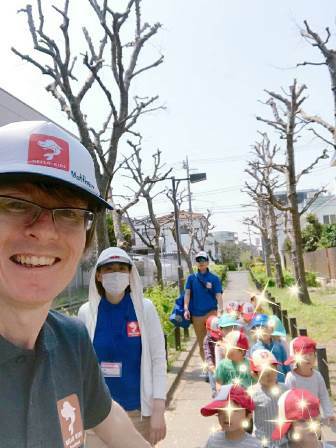 For the last 8 years I’ve been working only part-time in my school – afternoon elementary school kids classes only. Before that I was full-time as the main teacher in one of the pre-school morning classes. From today I’ve returned to those responsibilities!! It’s Back-to-Pre-School or me!! Understandably I was rather nervous all weekend! Over the last 8 years I’ve gained good insight into various aspects of teaching, and my classes had included many preschool aged students, but being responsible for the same group of 3~5 year-old kids every day from 10:00~2:30 requires energy and focus that I’m not used to, and of course I’m also 8 years older…! To my great relief it wasn’t as stressful as I was expecting, and I fell right back into the necessary frame of mind! My class has 17 kids. 11 of them come every day. 6 of them come once a week. Today there were 12 kids. The very first thing I did was make an effort to remember all of their names!! They were perhaps as nervous as I was, but we worked well together and got accustomed to each other quite quickly. They’re very cute!! Going back to preschool full-time will provide many interesting classroom experiences to share with you here!! I can already tell: THIS YEAR IS GOING TO BE a BIG, BIG YEAR! !